I was using 3 strong spring on my fender strat before, When I changed the RAW VINTAGE 5 spring, the tension become not so tide, and increase the low frequency, high frequency becomes more smooth. My SRV Stratocaster originally had stock springs and saddles. When I was introduced to Raw Vintage, I was a little skeptical because the instructions said to use 5 springs. However, now that I've installed the saddles and springs without even plugging into an amp, the guitar is fatter and louder! I have amazing tone now thanks to Raw Vintage saddles & springs! I recorded the my normal springs in my Xotic guitar, then "raw vintage" springs and there is a difference..I think the 'raw vintage" give the guitar more fat, bottom end. And more sustain....everywhere. Cool. After changing the springs,there are two points that you can feel one is the feeling with hands, and second is the tone.The most different is touch. The Flexibility of strings is getting better, but it shows in different position of neck. The lower position (fr.3 ∼ Fr7) with sixth and fifth string become very easy to play, bending and blending is getting much eaiser, you can show more emotions int that part.The middle position (fr.5 ∼ Fr8) with the fifth, the fourth and the third response more,And I think the best part is the high position (fr.10 ∼ Fr15) with the third and the second the position.Sunddenly, you feel you can do anything is that position, the hummer and pull and also easily done well. So,because the feeling with touch changed, it enhance my performance,I suspect the influence in tone is not because of the spring,so I record clean tone and distortion in open strings. Each open string sustain more, especially in the lower string. The volume is part of the largest changing, six string averagely increased 0.5 ∼ 1.3 db. The best part is tone.It sounds like you remove the rusted strings and change to new string.Each strings increase the sweet frequency. In distortion tone, lower string become more strong, you can do feedback anytime as you want. In clean tone, also with the high frequency, the sounds become significantly brighter, like you removed the cloth coverd in tone suddenly. Producer KANNEKI and PCI JAPAN staff show me this springs , i never know change the springs can change the guitar sound so much . It is really cool! When I first knew this product, I doubted that replacing my usual setting with 5 springs would make a difference, but as a matter of fact it really does! In addition to the improved sustain and sound transmission, the overall tone is simply astonishing, not to mention the advance in body resonance. Being able to receive such benefits for a relatively trivial amount of money, it is strongly recommend for every guitar player. My bros Mr. Six and PCI XOTiC staff Eric Chen showed me this godamn cool stuff. I've never seen any other springs that's more awe-shocking than the Raw Vintage Springs!! Without modifying the circuit or pickups of your guitar, the springs improved sustain and added more punch. After I've tried replacing them onto a Fender Custom Shop in the store and my own Jackson, I recommend those who cares about their tone to use this as well. All my musician friends has used the Raw Vintage Springs are satisfied with the outcome as well!! Raw Vintage Tremolo Springs are amazing! Ever since the first time I picked up an electric guitar, I've been endlessly striving to improve my tone. The Raw Vintage Springs have done exactly that for me, and is the product that I've been searching for all along! I own a great-sounding vintage 1989 Strat, but I've always had problems balancing the EQ's on the guitar amp for the neck and bridge pickups. If I set more lows for the bridge pickup, the neck pickup tends to sound muddy. However, if I roll off the lows or add highs for the neck pickup, then the guitar starts to sound too thin and harsh in the bridge position. One day, a friend brought over his MADE IN JAPAN Strat (with the Raw Vintage Tremolo Springs installed) to jam with me, and I immediately noticed that his tone was different from what I was familiar with, and better! I asked him what mods he made, and he replied simply, "I'm just using a new set of Raw Vintage springs." And within a few hours, I've purchased a set for myself and installed them on my guitar. All I can say is, I WAS BLOWN AWAY! After changing my springs, I don't have to spend much time dealing with EQ anymore, and my Strat sounds fuller and richer in the bridge position, and much much much clearer in the pickup position! Thanks to Raw Vintage, my Strats have finally come to life!! I play blues with my FENDER STRAT for almost 30 years. I notice that Stevie Ray Vaughan, John mayer , Eric Johnson 's STRAT use five spring on their guitar. But how to keep the balence of STRING, TREMOLO, and the SPRING are not easy. Now RAW VINTAGE fix the problem. 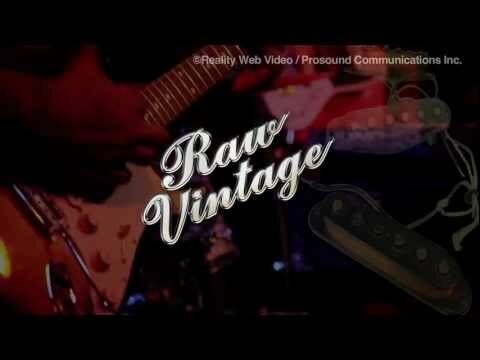 RAW VINTAGE SPRING, make me find my FENDER guitar's potential. 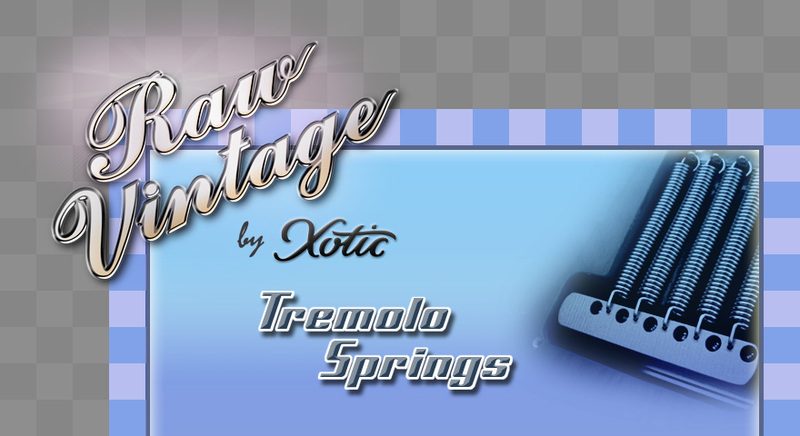 Raw Vintage has a new product "Tremolo Springs". I changed my springs as soon as I heard how it would better the tone. Once I had 5 springs attached, the whole body started resonating differently. And connected to the amp, the sound was fatter, transforming dry sound into greasy tone, and more volume as well! I was truly amazed what a difference these springs can make. Springs were put into my Xotic's custom made Stratocaster. My students at GIT (Musician's Institute) noticed the difference after hearing my guitar in class. They were surprised how fat my sound was and asked me, "Your guitar has a different tone today. Did you change the pickups?" If you use a Stratocaster-type guitar, I would recommend trying this Raw Vintage Tremolo Springs first if you are considering changing your pickups. With these springs, you will be able to change your sound at low cost. RAW VINTAGE springs change my guitar tone a lot , sustain longer , and aded more punch Without modifying the circuit or pickups of your guitar. I play FENDER strat for over 30 years . I already knew 3 strings to 5 strings will be change the guitar sound and tone a lot. But the tension of tremolo will be to tide to use. Now the RAW VINTAGE SPRING make it become perfect. Tremolo is easy to use. The sustain become longer , and the tone is totally fat. Recomend use 010 string with this spring. I use the RAW VINTAGE SPRING on my FENDER ERIC JOHNSON signature strat. RAW VINTAGE really excavate all the vintage secrets! I had those springs put on my guitar and I have to say, to my surpruse "It really makes a difference!!!" There is a new kind of "resonance" in my guitar!! It almost feels like there is some sort of inner reverb!!?? Very nice, very fresh, makes my guitar and my sound "sing" a bit more!!!!!!! Thank you very much!! I have known the little secret of putting 5 springs on the strat tremolo for a long time in order to increase the sustain of the guitar. However to me there was always a trade off with that scenario. I would achieve better sustain however it will come with harsh upper mids that would bother me sound wise. Also the tension would increase so tremolo would become useless. If I would back off with the 2 pivot screws to adjust the proper tension of the springs, then the tension would be right but the upper mid harshness would still be present and the whole process would be kind of a trade off and not quite right. I was pleasantly surprised when I have put Raw Vintage tremolo springs in it for few key reasons: One, I didn't know what to expect and was kind of sceptical at first. Second the lower tension of the springs allowed me to put 5 springs instead of standard 3 that I would have in my guitars and those 5 springs would have aprox. the same tension as the original 3. Now here is what came as a total shocking surprise, the tone itself was waaaay fuller, richer and there was a lot more sustain gained on my guitar. Fundamental notes were simply fuller, deeper, richer and there wasn't any unusual upper midrange harshness present at all. This is simply the most amazing improvement tonal wise on a strat that one can do and benefit for ridiculous marginal amount of money. But money on aside, even if it costed few hundred dollars it would be worth spending considering the dramatic improvement in tone! Raw Vintage saddles and tremolo springs made my guitars much more resonant, took out the metal harshness and added deepness with extra air to the sound. Notes got better balances through out the entire fretboard, include open position. Restored the original tone On my '63 Fender (Raw Vintage replaced generic parts which I put after the original had worn out), and added extra Phatness! Gave my newer custom Stratocaster a broken-in feel and sound, closer to vintage. This is one of the best upgrade I ever done to my guitars. Check them out! A couple years ago in LA studio session I saw guitar player had a Strat with 5 springs and he told me it can makes the better resonance and sustain, later I came back to Taiwan I tried his way but the difference wasn't that clear, till' to I got the Raw Vintage on my custom shop strat last month and I found there is a difference, it's fatter and more sustain, it's amazing! Now I can't wait to switch all my old strat 3 springs to Raw vintage 5 springs!